I don’t usually like to write about the same thing two weeks running. But when G2’s unbeaten run continues, and when Fnatic’s depressingly poor run carries on, what’s a boy to do? When the two meet head-to-head later in the week it seems the boy has no choice: it’s time to discuss Fnatic again. At least the latter finally got a win on the board, but the fact it came against the only below them in the standings – winless Rogue – is telling. Worse, the relief lasted just 24 hours. Against Misfits the following day, Fnatic looked nothing short of dire. The pre-game package was all about the perceived rivalry between Soaz and Bwipo – for obvious reasons. One was kept on Fnatic at the other’s expense. Both players were dismissive of any personal rivalry, while making it clear that they wanted to prove that they were the better player. In the event, Bwipo was a nonfactor. He was put into a difficult match-up – Sion versus Urgot – but he did little to impact the rest of the map, as a Sion is supposed to do. Meanwhile, Soaz did what he does best: win games of League of Legends. His play wasn’t spectacular, but top lane in the current meta-game very rarely is. I mean, unless TheShy is playing, obviously. It’s hard to look flashy on Urgot, but Soaz did put in a shift. He didn’t concede a single death, while contributing to more than his fair share of kills and keeping his former comrade out of the game. If this sounds like I’m indirectly sledging Bwipo, it’s only because Riot’s production drew so much attention to the battle of the former teammates. Yes, Bwipo assuredly came out second in that exchange, but the blame is Fnatic’s as a whole, not just his. 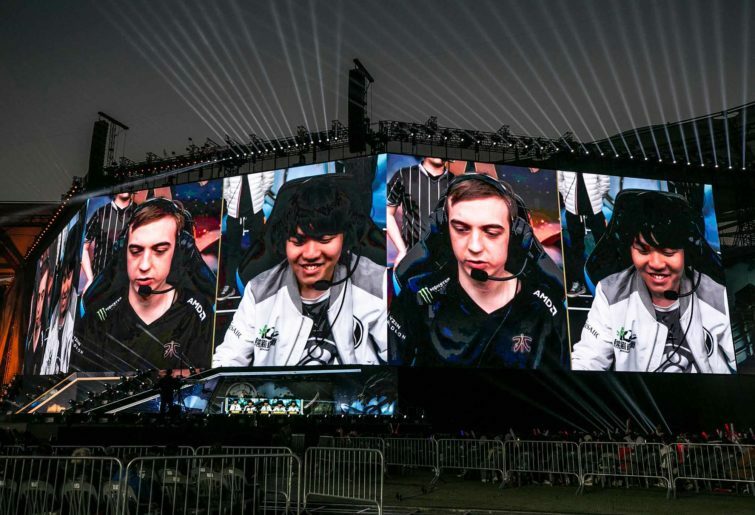 It was difficult to find any positives for Fnatic, so crushing was their defeat. Even Rekkles, often a light at the end of the tunnel during Fnatic’s dark times, was dim. He had the best KDA on the team, but when that number is 1/1/1 you can see why it’s not particularly impressive. His importance to the team was clear in the Rogue game, however. He closed out a difficult first win with a beautifully played pentakill on Kaisa. The jury is still out for Nemesis at this point. He looks like a diamond in the rough in one game, only to disappear the next. Filling Caps’ shoes is no easy task, but against Misfits he looked more like a socks and sandals type of guy. Even in the win against Rogue he was one of the quieter members of the team, picking up just one kill on Syndra – a champion who, when ahead, usually picks up kills just by looking at a squishy target. In his defence, he too was put into a dreadful match-up against Misfits. It’s rare that a professional game is decided in picks and bans, and I can see why Fnatic felt the needed to try some unusual strategies in the middle of such a rut, but Kassadin into LeBlanc? By itself, with winning lanes elsewhere, sure, maybe you get time to outscale. With two losing side lanes and a losing jungle match-up? It reeks of desperation. Anyone with a passing knowledge of competitive League can see what they were going for: survive to the 35 minute-mark and win almost by default. But when you pick losing match-ups in every single role, guess what happens: the game is over in a landslide before any of your carries get online. It’s about time I admitted that I was wrong about Fnatic pre-season. I said that even without Caps, they were favourites for the LEC title. In my entire esports career, I have probably never been more wrong. As things stand, Fnatic are probably glad that promotion and relegation have been done away with. Things don’t get any easier for the world finalists this week either. They face a surprisingly solid-looking Excel team. My fellow countrymen may be on a mediocre 2-4 record right now, but they have come closer than anyone to beating G2 and have looked inches away from turning some of those losses into wins. Historically, Fnatic would crush teams like Excel without breaking a sweat but, as things stand, this looks like a dangerous fixture. Confidence must be low in the Fnatic camp, but a loss to Excel can only make matters worse. Then, on Saturday, they face undefeated G2. In years gone by, this was the most exciting match of the season. On current form, though, it might end up being a whitewash. A 6-0 team going up against 1-5 team speaks for itself, regardless of the prestige attached to either team. And yet, if there is a ray of hope for Fnatic to turn this split around, this weekend could be it. Excel are eminently beatable if the Fnatic players remember that they’re actually good at this game. A confidence-boosting win over a mid-table team mixed with the big match hype of a historic rivalry could make for a potent cocktail. If Fnatic can rise to the occasion against G2 it could do wonders for their mindset. People say form is temporary and class is permanent – it’s time for Fnatic to prove it.